What’s to be done about Wesley Lake? Blogfinger visits the WL Commission. June 27, 2017. The Wesley Lake Commission was meeting in Neptune. A new chair was taking over, Gayle Rosewater, and some new members were present. Other than the Commission members, only 4 others were in attendance—me, Jack Bredin, an engineer from Maser Consulting, and a newly appointed, but not yet sworn- in, Commission member, Ocean Grover Susan Tyler. No one representing the Friends of Wesley Lake was there—how friendly is that? And no neighbors who live around Wesley Lake on either side were in the audience either. The Commission seems top heavy with Asburians, but they should be gaining two more Neptuners. As Jack pointed out to them, they had no agenda and no recording system. But the meeting was lively and covered a great many topics in the course of about two hours. The emphasis was on the dilemma of what to do about the dirty water in the Lake. 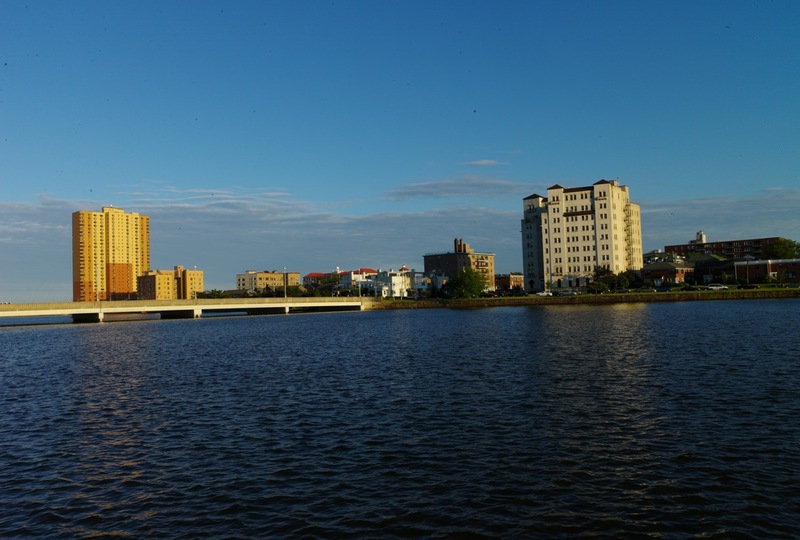 As you may know from a number of prior Blogfinger articles, the main cause of the deterioration in the Lake is the constant inflow of polluted ground water, mostly from Neptune Township, but also from Asbury Park. The meeting was a sort of potpourri of pollution topics, and as we have noted earlier, the Commission seemed to be interested in looking into remediation methodologies for cleaning the Lake. Consultant. An engineer was present to discuss the “water quality ” in the Lake. No one explained who hired him, and that is something that needs to be cleared up, because he seems to have been brought in to make the false case that the Lake is a man-made entity. That is no small distinction if someone in the shadows is thinking about filling in the “detention-retention basin” in the future. We think the Commission should choose their engineer and it should be one who is independent. This one is flawed, and the Neptune engineer should not be chosen either due to conflicts of interest. Water quality. It was agreed that the water is “not the best.” The Lake is a “sink” for dirty ground water to collect, and nothing is currently being done about that. After a rain last week, one could smell oil in the water which also contains grass clippings, floatables, geese droppings, ammonia, and salt. There was no result for nitrogen. A Commissioner described it as “terrible.” Herbicides were used recently for pond weeds. Jurisdiction. Jack Bredin questioned the legitimacy of the Commission because the current Agreement of Charter amendment has not been properly completed with signatures of parties from both towns, with dates, seals, and with a proper water-shed map. This is important because the jurisdiction of the Commission is to be defined by that map, and the Commission has top power over the Lake, even above the two towns. Remediation of water conditions. The engineer said that there are too many “points of entry” of dirty water into the Lake to be handled at each location. He also expressed doubt that a treatment plant to clean the water prior to its entry into the Lake could be accomplished. The DPW representative from Neptune said that “it would cost $700 million. ” He sarcastically meant that it would be financially not possible, but he is probably wrong. Turn the Lake back to its natural state as an estuary. No one there mentioned that, but we have reported it in Blogfinger. Our articles on Wesley Lake can be reviewed by typing “Wesley Lake” into our search box on the top right of this page. Turn the lake into a treatment facility: The engineer brought this up. He said that as the lake fills with filth it becomes a retention/detention basin (which is what Neptune currently calls it) and “then you don’t have a lake anymore.” This sounds to us as a set-up for developers to eventually call for filling in the “basin” to provide more land for development and for avoiding the ground water problem as it currently exists. Flow issues: The water quality is an issue, but so is the amount of water flowing into the lake. The current storm water management systems on both sides (infrastructure) are inadequate when there are heavy rain storms. The systems fill up and then flooding occurs. Time for the Mayor of Neptune to resign. Mayor Brantley is on the Commission and he seems impatient with the situation. He said, “We’re wasting a lot of time now.” He also pressured the Commission to appoint the Neptune Engineer to guide them. This would be a mistake. Definition of “watershed.” Wesley Lake is a “tidal waterway” and, as such, is subject to public trust rights. It is reserved for recreation by the Green Acres program of the DEP. The watershed refers to all the natural water sources that feed into the Lake. It does not pertain to streets and storm sewers. The Commission has to be a proper steward of that watershed. The watershed map should be revealing once it is revealed, and it should not contain streets. It should be signed by a licensed engineer. Ethical behavior of Commission members. At the end of the meeting, there was a public portion. Jack Bredin got up and raised a number of issues with the Commission, some of which were critical. Jack told them that his agenda was the same as theirs—-to save Wesley Lake. But at one tense point a Commissioner, the DPW representative from Neptune Township, out of order, shouted out to Jack “What is your agenda?” One of other Commissioners was horrified and said so. That Commissioner who verbally abused a citizen should be formally censored by the Commission. Blogfinger will try to find out what’s it all about Alfie. Researcher: Jack Bredin of Ocean Grove; Blogfinger staff. Wesley Lake unchanged? Look at these two old maps. Map reference courtesy of Carl Swenson (OG). Click to see details. Note island in the Lake and the east termination to the ocean. Click for enlarged details. Note a large stream feeding into or next to Wesley Lake originating in the Whitesville area. Where is that stream today? You can imagine how pristine the Lake water was back then, at least 150 years ago; much different from today, despite what the “professor” on the Wesley Lake Commission says. © Reposted from prior Blogfinger article. 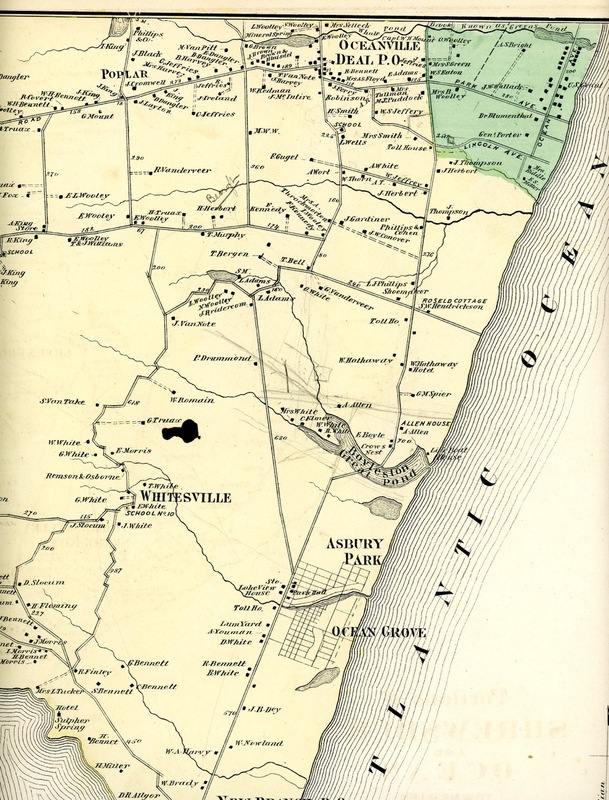 In our last article about Wesley Lake, we have a quote from a “professor/scientist” on the Commission who said, ” “The condition of Wesley Lake is the same now as it has been for the last 10,000 years.” But above is a map from around the time of the founding of Ocean Grove. You can see that even since then, things are different. The lower map shows a large water-way heading towards Wesley Lake, and note how the lake opens directly into the Ocean. There are other maps that show feeder stream water sources emptying into the Lake from the west; now gone. Water near the retaining wall by Founders’ Park in OG. Blogfinger (Stephen Goldfinger) photo. 12/7/16 © Click it and then take a deep breath. Is it any wonder that not a single bird was in sight? Wesley Lake, west end. March 28, 2017. Paul Goldfinger photo © Click to enlarge. Photograph from the muckrakers at Blogfinger–Paul Goldfinger.© March, 2017. 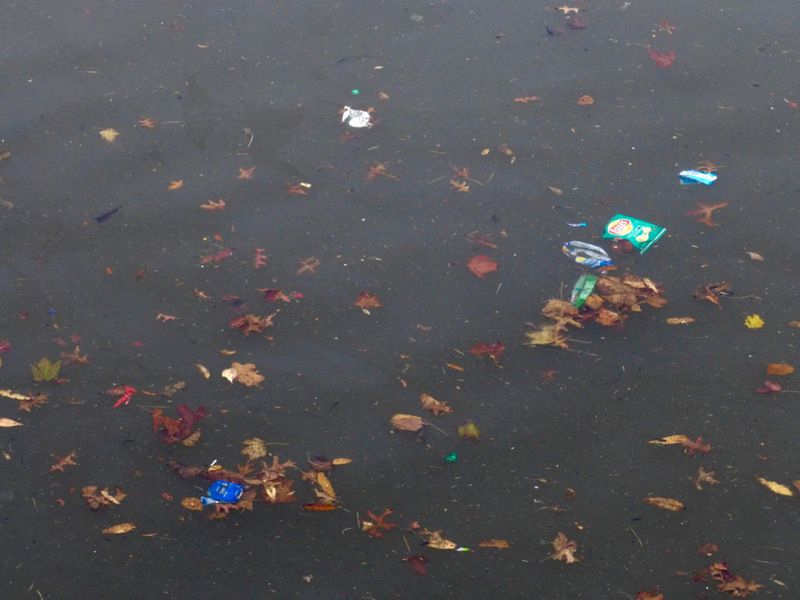 Blogfinger has posted a variety of articles about Wesley Lake pollution. Today we feature yet another piece on that subject which contains some new elements which we have not addressed before. Q: The Lenape Indians used Wesley Lake as a source of food. Now the Lake is reserved for recreation and conservation—-or is it? 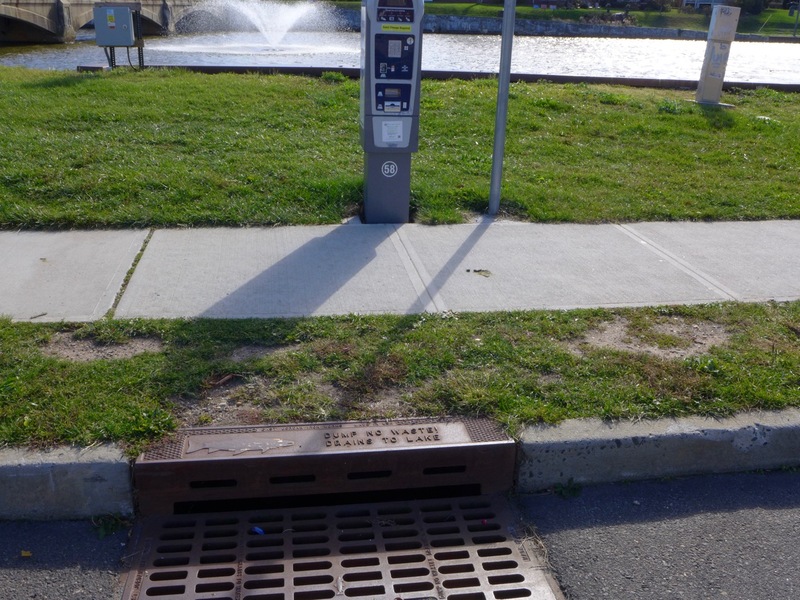 A: According to the Neptune township Tax Map (effective Jan. 1, 2015) Wesley Lake is now a municipal facility to be used to treat dirty street-water runoff. The Lake’s name has been changed to ” Wesley Detention/Retention Basin” under the supervision of the Departments of Public Works. A: It starts with the Neptune Township Committee along with the Mayor and Council of Asbury Park. The two governing bodies are in charge, so the buck stops with them, or in this case, the pollution starts and stops with them. 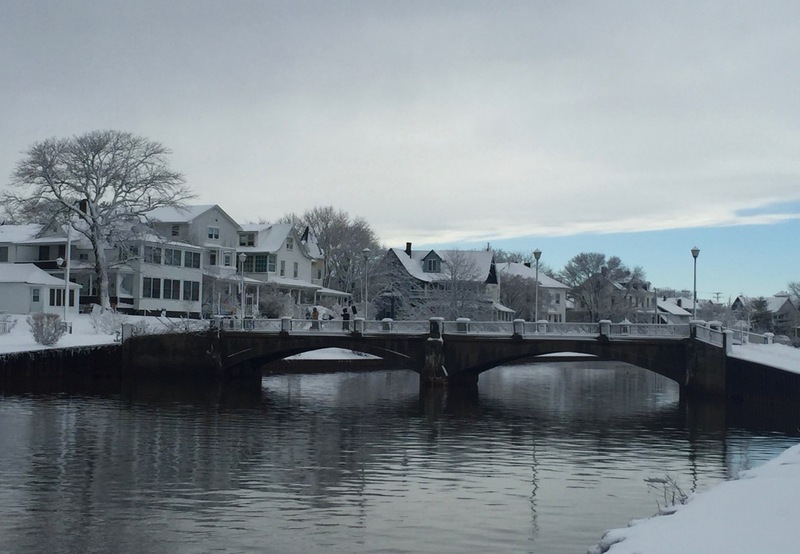 Officials from both towns took an oath that would include managing the welfare of the Lake for recreational use. It should be noted that most of the dirty street-water runoff comes from AP. A: It happened when the mayors of both Neptune and AP took their charters and hung them on the developers’ walls. Q: Who can correct this plethora of problems involving the Lake’s rehabilitation and restoration? A: The Wesley Lake Commission. Or can they? Jack attended a meeting of the Commission on May 16, 2017, and suggested that they should not allow street-water runoff to enter the Lake because that is causing the Lake to be polluted. And the streets are not part of the Lake’s natural watershed. But the “watershed area” includes all the land that drains into the lake, and by that definition, it does includes street run-off. But there is a semantic issue here. He would be correct if the streets were a part of the Lake’s “natural watershed” and not just “in the watershed area.” The”natural water-shed area” is desirable, but dirty street water is not part of that. You might have noticed the Rainwater Garden near the train station in Asbury Park. That is an example of a desirable “natural” water-shed area where the rain is purified by the soil and plantings and then the clean water drains into the lake. 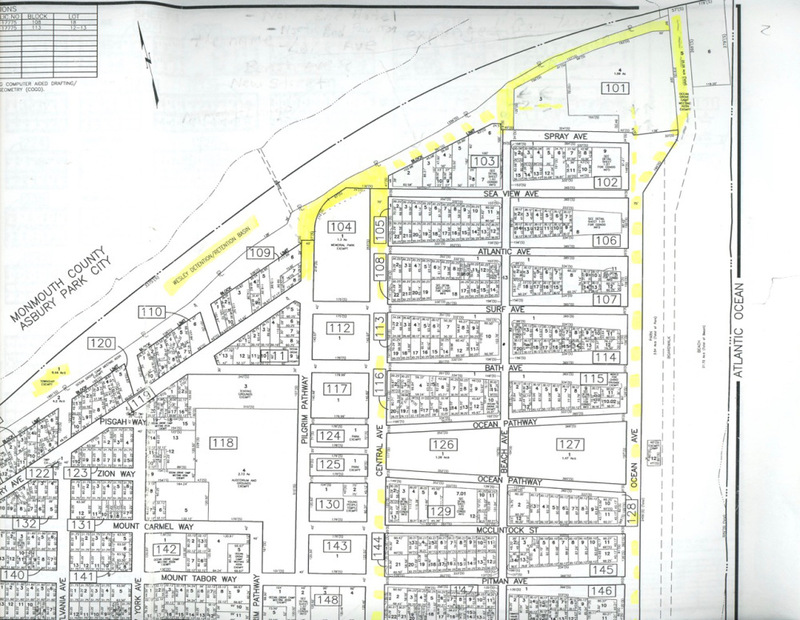 And if the name change from Wesley Lake to “Wesley Detention/Retention Basin” had been done legally by Resolution of the Neptune Committee with permission from the New Jersey DEP Green Acres Program, then the streets would become “the watershed” for a detention/retention basin, but there was no such Resolution or Green Acres permission. Note that a detention/retention basin is an actual structural facility to clean the water draining into the Lake. So far all we have is a name change on the Neptune Tax Map. We don’t even have a map that shows the Lake’s water-shed. And we don’t know where A. Park stands on this, but we can guess. So what’s in a name?–in this case, nothing. 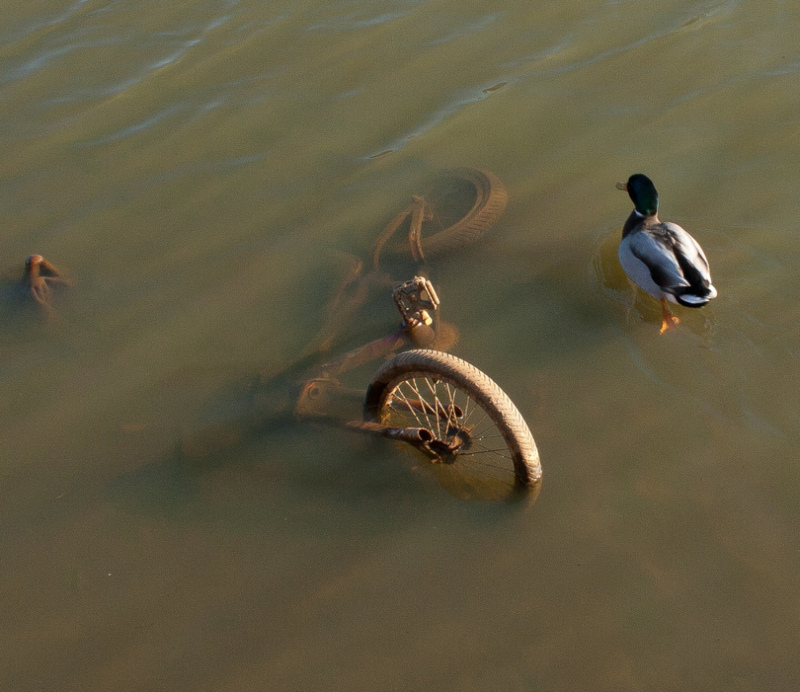 We think the dead fish never got the professor’s message. And, we have to remind the professor, that 10,000 years ago they were first brewing beer in Mesopotamia, but there are no records of what Wesley Lake looked like then. We barely know about it from records of 1869. We do know that it was much different than it is now—then it was a full blown estuary. And don’t forget, the water may look or test clear sometimes, but what toxins are trapped in the mud? They don’t test the mud, only the water, and how often do they test the water? 2. “The road to “Condo-City:” This road would be a fantasy by certain factions in Ocean Grove who might see the Lake as a dead-end street where the polluted silt (ie mud) builds up to a point where dredging and disposing of all that polluted mud becomes economically unfeasible. And that leads to a scripted conclusion that it would be more cost effective to “cap” the mud, fill in the Lake, and build some modern, up-to-date condominiums. It could happen! A Blogfinger proposal to restore Wesley Lake. “Black and Blue” Wesley Lake in May, 2014. Photograph by Bob Bowné. © Special to Blogfinger. In December, 2016, we were visiting the Land Use Department of the Neptune Township Mother Ship. We were at the counter occupied by the Assistant Land Use Administrator–George Waterman. On the counter were some educational fliers. Below is a link to a recent article on Blogfinger about our effort to discuss that brochure with Waterman. 1. The expectation of area residents to use Wesley Lake for recreation is reasonable. 2. 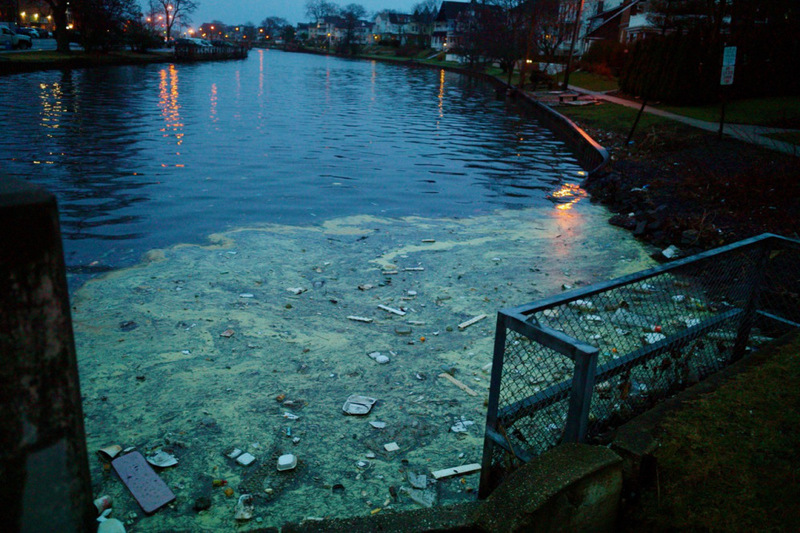 The Neptune Township Committee and the Wesley Lake Commission’s plan to use Wesley Lake as a municipal facility to treat polluted street water is unreasonable. 5. On March 27, 2017, Jack Bredin attended the latest meeting of the Neptune Township Committee. He wanted to acquaint them with our plan to help remediate the filth in Wesley Lake. As Jack was speaking, Neptune Township Business Administrator Vito Gadaleta rolled his eyes and laughed at the proposal. The only reply from the Committee was from Mayor Michael Brantley who is also a member of the Neptune Planning Board and the Chairman of the Wesley Lake Commission, and he said, “Your five minutes are up.” The rest of the Committee members at the meeting reserved their right to remain silent. a. The Wesley Lake Commission, Neptune Township, and Asbury Park, working together, should prepare an engineering plan to divert all street water run-off pipes that drain into Wesley Lake into one pipe that drains into a new detention basin for treatment before being released into the Ocean. This would stop polluted water from entering the Lake and the Ocean. b. Drain the Lake and remove all the polluted mud. c. As most of the water that flows into Wesley Lake is from the streets, and that will be cut off, it will be necessary to establish a new supply of water, and we have one located several hundred feet to the east. d. Build a small pump-station next to the Lake’s outflow pipe that would pump water from the Atlantic Ocean into the lake when necessary. The Lake would then be as clean as the Ocean. If any of our readers have a plan, let’s hear from you. Deal Lake citizens make progress towards cleaning the lake water. We should do the same for Wesley Lake. Deal Lake by Paul Goldfinger @Blogfinger.net c. 2014. © Click to enlarge the E.Coli. Deal Lake water quality is a concern, but the citizens there are doing something about it. In a piece posted in the latest Coaster (Dec 22, 2016) we learn that the Monmouth County Health Department will embark on a quarterly testing program to find out “if Deal Lake water is a health hazard.” The county will be doing multiple quality testing over the next two years. That program will need to be approved by the State DEP. The article tells us that the county has many resources which can be mobilized for lake water safety, and the Monmouth County Board of Chosen Freeholders, led by Freeholder John P. Curley, held a conference call in October which included the Monmouth County Engineer Joseph Ettore; County Public Health Coordinator and Health Officer Christopher P. Merkel, Environmental Specialist Turner Shell, and Testing Manager Joel Grimm. As a result of that activism, some new results should be seen at Deal Lake which borders 7 towns in this area. GEORGE FRIDERIC HANDEL: “Water Music Suite 2, D major.” Academy of Ancient Music. WHO KILLED WESLEY LAKE? Part 2: What’s in a name? 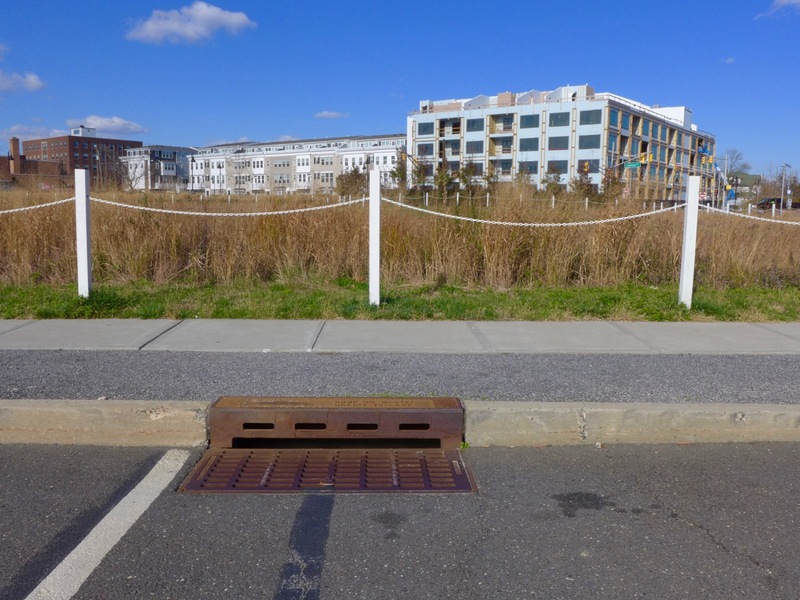 This storm sewer in AP faces Wesley Lake*. On it (see below) the inscription says “Drains to Lake.” Note the existing condos, the condos under construction, and the field waiting for more condos. Blogfinger photo. 11/11/16 © Click to enlarge. View towards OG from A. Park’s Lake Avenue. Blogfinger photo. 11/11/16 © Click to park your car; or go to Ocean Grove and park for free. Question: What have we learned since Part 1? But Tee and Keith, along with the other committed volunteers working towards the rehabilitation of the Lake, are in an uphill battle, until fish start making campaign contributions to environmentally interested political candidates. Or when more concerned citizens start showing up at meetings as suggested by Tee and Keith. The world is run by people who attend meetings and share their concerns on the record. While most of us were at home watching “Dancing With the Stars,” the politicians were “Dancing With the Developers,” and giving away Wesley Lake. What can be done short of an investigation by the NJ State Attorney General? Official Neptune Tax Map. The new name of Wesley Lake is “Wesley Detention/Retention Basin.” Click to read the name. First, we must insist that the Neptune Township Committee explain the Wesley Lake name change as seen on the current Tax Map (above.) That change was made without a formal resolution at the Committee. That new name suggests that the Lake is to become a municipal facility with some sort of mechanism to clean Lake water and deal with the runoff from the OG North End Redevelopment. Or is the name change a hoax or smokescreen to deceive those who would approve the NERP? 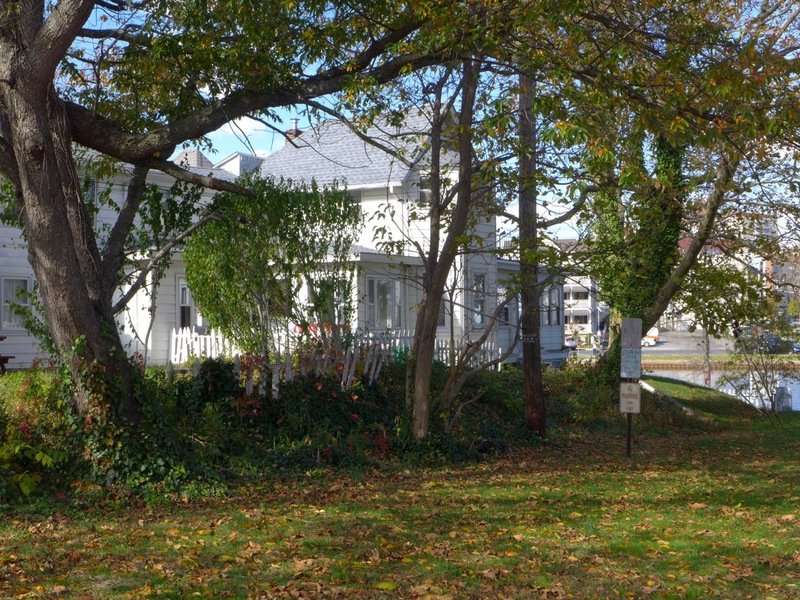 The Tax Map is the official map, and all other Municipal, Commission, County, State DEP and Green Acre maps that identify the Lake must be consistent with the Neptune Township Tax Map, or the Committee must change the name back from “Wesley Detention/Retention Basin” to “Wesley Lake”—a name which it has had for nearly 150 years. Then, as a start, Blogfinger has suggested that the Master Plans and Redevelopment Plans in both Asbury Park and Ocean Grove be revisited and reviewed to address the street-water run-off that flows into Wesley Lake. The dirty-water run-off into the Lake, mostly from AP, is the main source of pollution in the Lake. In the photograph on top*, you can see a large empty lot where rainwater simply soaks into the ground, not into the Lake. But that property will be developed, and all that water run-off will be added to the flow into the Lake. The southern area of AP is replete with condominiums, high rises, paved parking lots, roads, and curbs which guide water to sewers. This drainage area includes the dense commercial blocks around Cookman Avenue and on Main Street. And the development of AP is still active with new and planned construction which creates additional run-off into the Lake. Treating the Lake pollution with chemicals and having periodic dredging and cleanups is just “kicking the cans down the road.” If the amount of dirty water keeps running into the Lake in increasing amounts with each new development, then the situation will keep getting worse. And that spotlight will shine on Ocean Grove if the North End plan gets going as currently designed. 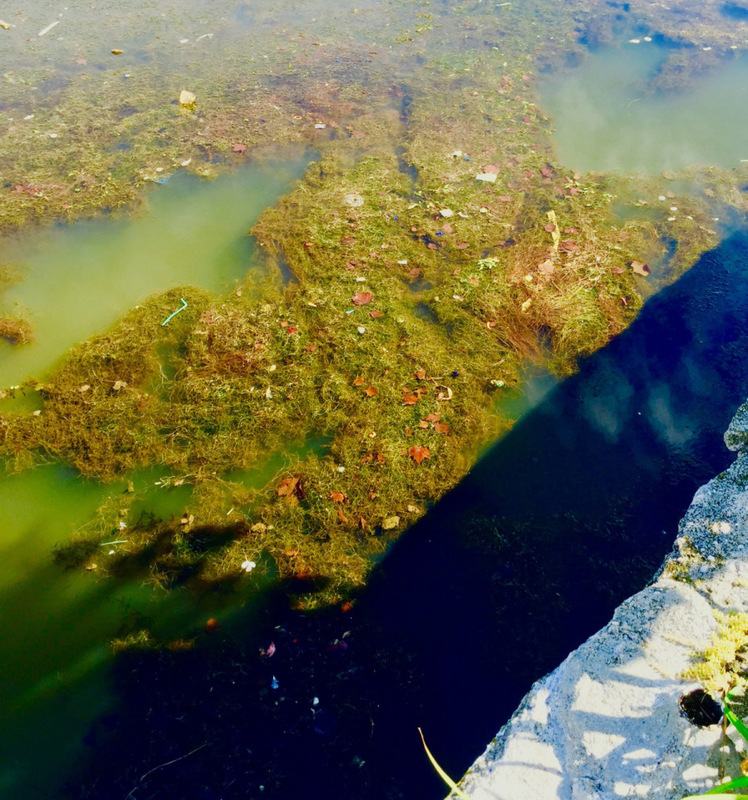 Clearly, dealing with the dirty water before it reaches the Lake and restoring the estuary are two significant ways to solve much of the problem and will greatly reduce the need for Lake chemicals, cleanups and dredging. And it will bring back natural life to Wesley Lake and reduce pouring dirty water into the Ocean. 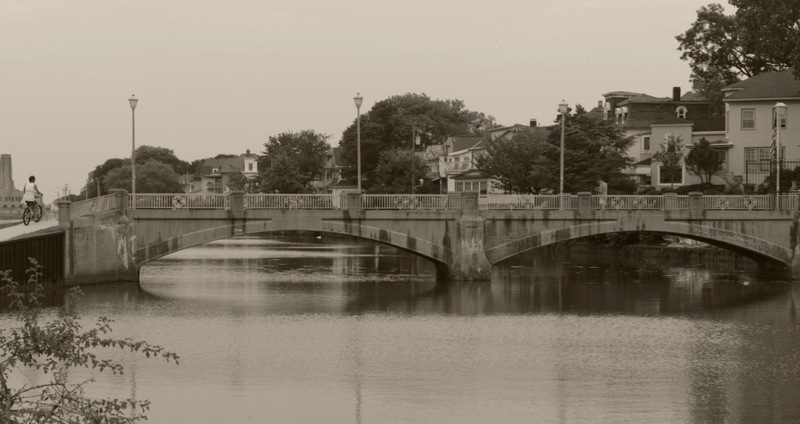 Maybe Ocean Grove could once again have Illumination Night on the Lake along with boating, fishing and other recreational activities which can improve life styles in town and bring back the historic waterway that we had over 100 years ago. STUART MATTHEWMAN. “Amapola” From the soundtrack of Twins Falls, Idaho. WHO KILLED WESLEY LAKE? Part 1: Let the muckraking begin. By Paul Goldfinger, Editor @Blogfinger and Jack Bredin, Blogfinger reporter and researcher. Question: When is a lake not a lake? Answer: When it is needed by developers. 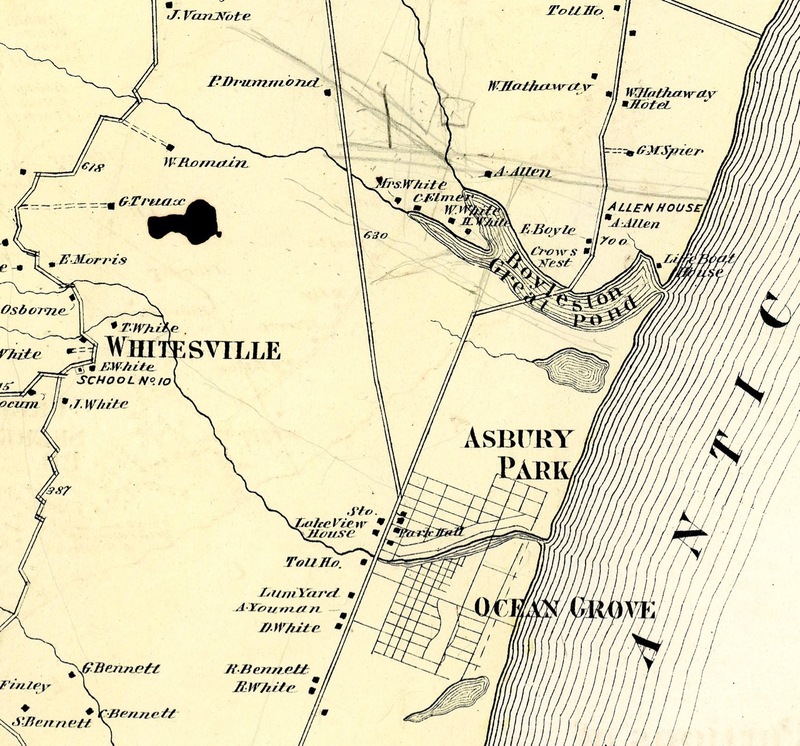 When Ocean Grove was founded in 1869, Wesley Lake was called “Long Pond.” It was an estuary. This means that a network of fresh water streams flowed from the west and emptied into the Pond; then the Pond emptied directly into the Atlantic Ocean. Within the estuary, salt water from the Ocean would flow in with the high tide and mix with the fresh water in the Pond. Then the water would flow out with the low tide. The clear brackish water in the Pond created the perfect conditions for an abundance of life to thrive there; the Pond was a rich source of food for many generations of Lenape Indians and it was a spectacular natural ecosystem when the OGCMA established Ocean Grove. When the OG Camp Meeting Association purchased all the land parcels needed to establish the town, the Ross Pavilion and Campgrounds, located at the North End, next to Long Pond, were already operating. The OGCMA’s original plan at the North End was for single-family houses, but the Pavilion and the Campgrounds would become a popular vacation destination on the Jersey Shore, and the Pavilion could serve up to 2,000 meals each day. As the Town of Ocean Grove had no sewer system, the Pavilion’s owners developed their own private system. A dam was built at the Pond’s Ocean inlet, separating the Pond from the Ocean. With that event, the estuary no longer existed, and the estuary had become a lake. The OGCMA changed the name to Wesley Lake. The fresh clean water from the Lake would then flow over the top of the dam and into a water retention basin located about 4 feet below the top of the dam. A sewer pipe would carry the wastewater from the Pavilion to the same water retention basin. That dirty water from the Pavilion consisted of raw sewage from indoor toilets and water from sinks, cooking, and bathtubs. That mixture of Lake freshwater and untreated wastewater collecting in the basin would then flow through another pipe, running under the beach, to be discharged hundreds of feet out into the Atlantic Ocean. The Ross pavilion sewer system was later used for the CMA’s plan to replace the Pavilion with the 1910 North End Complex that included a hotel, a new pavilion, swimming pool, cafeteria, boardwalk amusements and the Strand Theater. The North End Complex closed years ago, but the dam, basin and piping to the ocean remain intact. 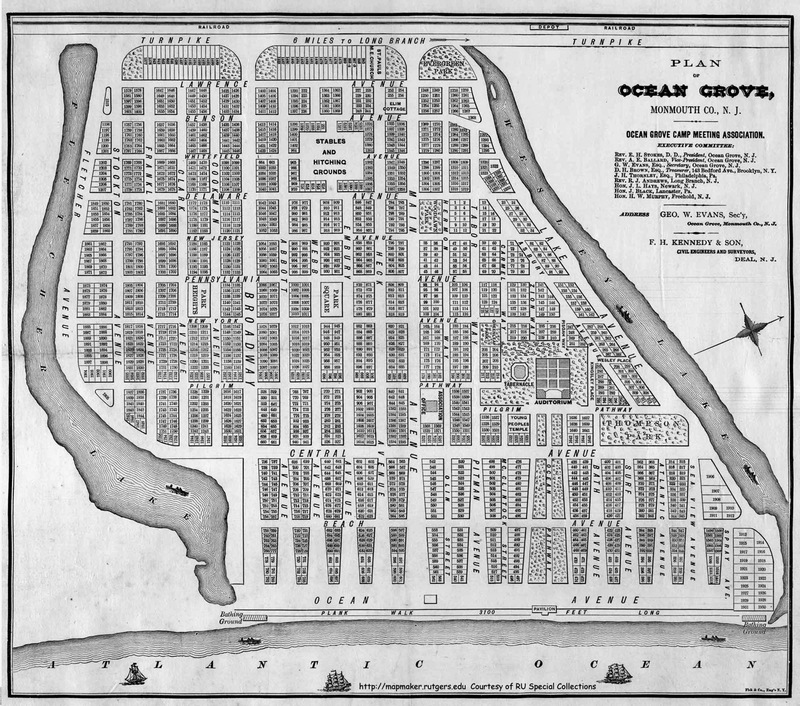 Today, Ocean Grove has a sewer system to treat the wastewater from indoor plumbing, however the clear fresh water from natural streams that used to run into Wesley Lake has been cut off by urban sprawl and replaced in large part with the dirty-water run-off from paved streets, mostly in Asbury Park, and it is killing the Lake. The amount of dirty-water run-off from the streets of OG into Wesley Lake is miniscule by comparison, but that could change with the proposed North End Redevelopment Plan. That street dirty-water mostly comes off paved streets and it contains silt, toxins, chemicals, garbage, animal feces, and dead animals. Toxins from under the ground (eg from old gas tanks in Asbury) leach into the soil to wind up in the Lake. Canada geese, which used to stop temporarily at the estuary, now stay permanently to foul the ground water. The Lake water became inhospitable for healthy plant and animal life. The vibrant living ecosystem of the area had been destroyed. The Redevelopment Plans for Asbury Park and Ocean Grove need to address the street-water run-off into the Lake, or maybe they already have, but now, for all intents and purposes, Wesley Lake is dead, even though there is a bi-town “Wesley Lake Commission” charged with the responsibility of protecting the use of the Lake for “Recreation and Conservation” only. Their mission is not to deal with street water run-off. Under the jurisdiction of the Wesley Lake Commission, in 2014, the name of the Lake was officially changed on the Tax Map to “Wesley Lake Detention/Retention Basin. “ In other words, the entire Lake is now a bi-town municipal facility. The plan is for the Lake to be used to decontaminate dirty-water run-off from the streets of Asbury Park predominantly, using that same old “sewer system” that empties into the Atlantic Ocean. 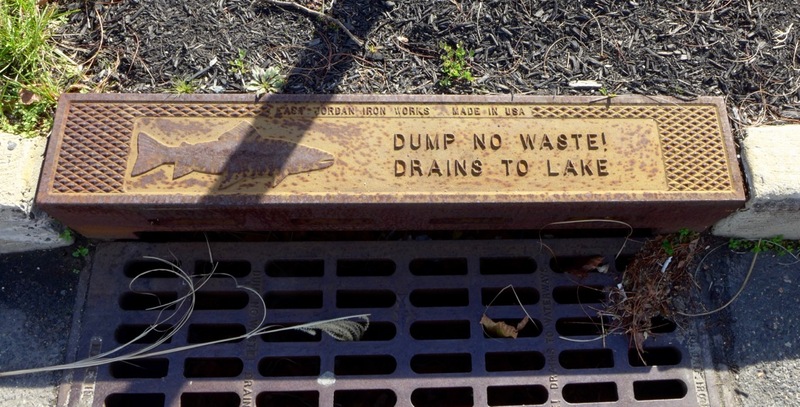 By allowing dirty-water drainage due to urban sprawl to enter the Lake and the Ocean, the Wesley Lake Commission has failed in its mission and it has written its own obituary. Where is the AWOL Ocean Grove Home Groaners’ Association on this issue? Where is the State Dept. of Environmental Protection in all of this? Wesley Lake is on the Green Acre list and map of “Public Open Space” where it is reserved by the State of New Jersey for “Recreation and Conservation in Perpetuity?” Who is enforcing that mandate of “recreation and conservation” at Wesley Lake? There should be a recorded Deed Restriction that reserves the use of Wesley Lake for recreation and conservation. That should be located at the County. We at Blogfinger suggest that the mission and master plan of the Wesley Lake Commission should be to restore the Lake back to an estuary. The State or the Army Corps of Engineers should develop a plan to remove the Wesley Lake dam and restore the Ocean Inlet, letting Mother Nature reestablish the estuary and secondarily the health of the lake. Of course something would have to be done to pipe the filthy storm sewer drainage elsewhere. Watch for more installments of this important topic. 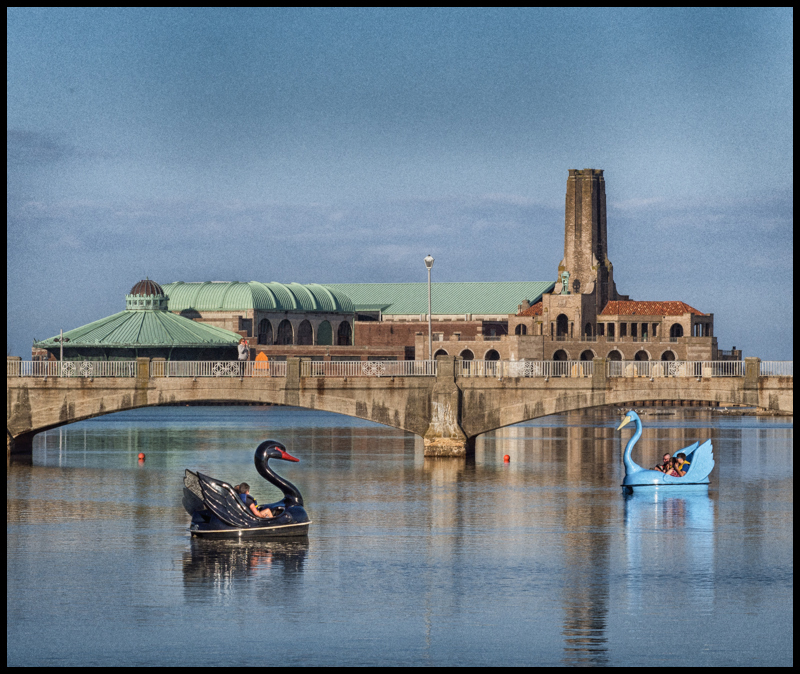 Wesley Lake, Ocean Grove. Photos by Paul Goldfinger 2014 © Click to enlarge. 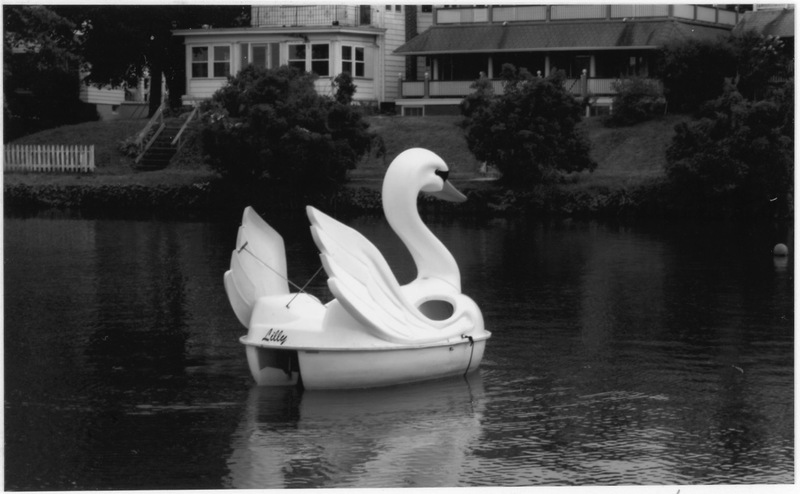 A swan’s adventure: Going it alone on Wesley Lake.